The recent nomination of Ashton Carter for U.S. Secretary of Defense raises the prospect of a more hawkish foreign policy. In particular, Carter’s past positions on North Korea may portend policy choices that could put the lives of Koreans on both sides of the border at risk. In Carter’s mind, any response by North Korea would start a war. The presumption was that the United States would be blameless for its initial attack. “[W]e would be calling their bluff,” Carter explained. The senselessness of expecting North Korea to acquiesce in being attacked can be gauged by imagining the reverse. If some other nation bombed an American nuclear plant, sending radioactive material billowing across a large swath of territory, would one expect the U.S. to do nothing in response? South Korean President Kim Young-Sam was not as indifferent to the sacrifice of Korean lives as were officials of the Clinton Administration. “At that time the situation was really dangerous,” he later recalled. “The Clinton government was preparing for war,” with an aircraft carrier off the coast and U.S. warships preparing for a naval bombardment. As American forces were being deployed, Kim warned U.S. Ambassador James Laney that another war would turn all of Korea into a bloodbath, and South Korea would not move “even a single soldier” in support of the U.S. war. Kim then phoned President Clinton and argued with him for 32 minutes. “I told him there would be no inter-Korean war while I was president. Clinton tried to persuade me to change my mind, but I criticized the United States for planning to stage a war with the North on our land.”  Although Clinton relented by the end of the phone call, he considered South Korean opposition only a temporary setback and continued to plan for war. Alarmed at the drift to war, former U.S. President Jimmy Carter intervened directly by flying on a personal mission to Pyongyang for talks with North Korean officials. After the initial talks, Carter phoned the White House, interrupting a council of war then in progress. Carter passed along the news that North Korean leader Kim Il Sung had agreed to engage in negotiations with the U.S. on a final resolution of the nuclear issue. Knowing the White House might be inclined to ignore the prospect of a negotiated settlement, Carter said he had arranged for a CNN film crew to transmit an immediate live broadcast in which he would announce the outcome of his meeting with Kim. When news of Jimmy Carter’s intention was announced to others at the White House council of war, they reacted with indignation. Tuning to CNN, Clinton Administration officials watched with fury as Carter announced a North Korean commitment to negotiate the nuclear issue. “Nothing should be done to exacerbate the situation now,” Carter added. The following day, negotiations between Carter and Kim resulted in North Korea agreeing not to reprocess spent fuel at Yongbyon, thereby removing the last excuse the U.S. side had for spurning a diplomatic solution. Unused military plans can always be dusted off for later use. In the days leading up to North Korea’s failed launch of a Taepodong-2 missile on July 5, 2006, Ashton Carter, in an editorial he co-wrote with William Perry, declared, “The United States should immediately make clear its intention to strike and destroy the North Korean Taepodong missile before it can be launched.” Carter admitted, “Our South Korean allies will surely not support this ultimatum – indeed they will vigorously oppose it. The United States should accordingly make clear to the North that the South will play no role in the attack, which can be carried out entirely with U.S. forces and without use of South Korean territory.” Anticipated South Korean opposition was not a factor for Carter in his advocacy of military action in which Korean lives would be lost. In a striking display of hypocrisy, American outrage over North Korea’s launch in 2006 came just weeks after the United States test fired a Minuteman III ICBM on June 14. The U.S. missile flew 4,800 miles before its three warheads stuck the Kwajalein Missile Range in the Marshall Islands. “Diplomacy with North Korea must have a coercive dimension, so economic strangulation and use of military force must be credibly on the table,” Carter has written. “But they can and should be used only when diplomacy has been shown to have been tried and failed.”  The Obama Administration steadfastly refuses to engage in diplomacy, claiming that diplomacy has failed even while ignoring the fact that it was the United States which first violated each agreement before North Korea followed suit. The conventional wisdom in the United States is that diplomacy has been tried and found wanting. There can be no dialogue unless the North Koreans first give the United States everything it wants without getting anything in return other than the vague promise of talk. For Carter, this means there remains no impediment to the use of military force. 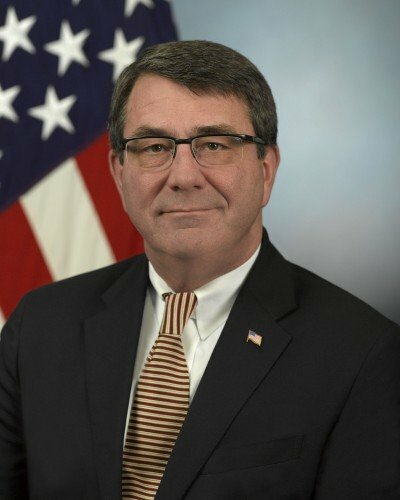 Ashton Carter is popular with both the Democratic Party and the Republican Party for his technocratic abilities and his eagerness for military action, and he is expected to be easily confirmed as the next U.S. Secretary of Defense. In that role, he will not make policy, but he will be in a strong position to advocate his positions and to influence policy. Carter has shown a marked disregard for the lives that would be lost in the reckless actions he has proposed. It remains to be seen how much influence he will wield and how U.S. policy towards North Korea may change in the Obama Administration’s remaining two years in office, but it cannot be ruled out that South Korea may find itself in the position of having to block the United States from plunging the peninsula into war. Leon V. Sigal, Disarming Strangers, Princeton University Press, Princeton, 1997. Ashton B. Carter and William J. Perry, “Back to the Brink,” Washington Post, October 20, 2002. Interview with Ashton Carter, Frontline, Public Broadcasting Service, March 3, 2003. “Seoul Simulated Bombing of N. Korean Nuclear Plant,” Chosun Ilbo (Seoul), June 6, 2005. “South Korea Stopped US Strike on North Korea,” Agence France-Presse, May 24, 2000. Kenneth R. Bazinet, “U.S., North Korea Near War in 1994,” New York Daily News, October 19, 2002. Ashton B. Carter and William J. Perry, “If Necessary, Strike and Destroy,” Washington Post, June 22, 2006. Ashton B. Carter and William J. Perry, “The Case for a Preemptive Strike on North Korea’s Missiles,” Time, July 8, 2006. Ashton B. Carter, “The Korean Nuclear Crisis,” Harvard Magazine, September-October 2003.